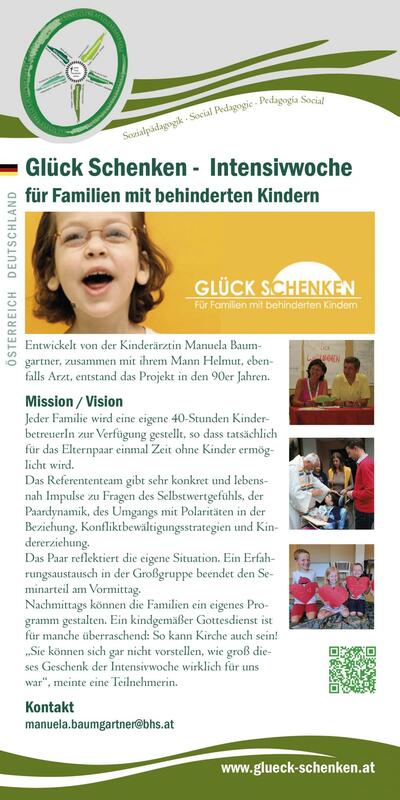 Developed by the paediatrician, Manuela Baumgartnert ogether with her husband, Helmut, who is also a doctor, she started the project in the 1990s. Each family is given their own child minder for 40 hours per week, so that it is possible for the parents to spend some time without their children. The team of lecturers offers very practical and realistic ideas on questions of self esteem, the dynamics of being a couple, dealing with polarity in their relationship, strategies for dealing with conflict and the education of children. The couple reflect directly on their own situation. In the afternoon the families explore their surroundings or create their own programme. “You can‘t imagine what a gift the intensive week was for us”, one participant remarked.